The Nazra (Homo lumini, spoken nuzz-ru) are a peaceful species, highly relying on cooperation, avoiding conflicts wherever possible and heavily respecting their environment. They did not go through any biological evolution as they were originally created by the Zra to preserve their legacy. Nazra are technologically advanced and have limited telepathic and telekinetic abilities. From a biological perspective they belong to the cold-blooded (poikilothermic) vertebrates. Notable attributes are their fair and bright skin, long and pointy ears (mostly pointing downwards) and particularly big, red eye pupils. Unlike most creatures the Nazra haven't had an evolution, instead they were created artificially. Accordingly, they have no biological relatives and can't be classified in the phylogenetic tree. Why they still look very similar to humans, despite the enormous biological differences, hasn't been discovered. In accordance with the theory of Mattheus it's most likely that the similarity is reversed; that humans actually look like the Nazra. Around 65 mio years ago the Zra created a habitat for the Nazra. In the process a terraforming of the earth took place, in which two separate living spaces were created: The known surface, called the ouside world, and the world Ancyria, a spherical shell inside the planet. During the transformation, living conditions were greatly affected on the surface, so that around 50% of all life forms became extinct, including the dinosaurs (except the birds because they're great ). Due to their technological level the Nazra aren't bound to a fixed habitat. They demonstrate this by leaving the earth after the great human conflict (at the time of the earthly middle ages) to seek for a new home. This epoch is called Arkorium and takes round 2,200 years whereby the artificial environment of the arks temporarily are the only habitat of the Nazra. The theory of Mattheus says, that the evolution of the humans was rather triggered by the Nazra instead of just being influenced by them. It argues that the Nazra had someday given the monkeys, as their most similar species (at least visually), their intelligence. However, there is no proof that the Nazra have ever set a foot on the outside world, observed or changed the life there. Therefore a similar theory says, that the Nazra triggered or supported human evolution unconsciously. It's explained by eg. radioactive radiation, which was emitted either from Nazra themselves or the Ancyrian sun as their source of energy. Both theories remain unproofed however. Nazra are a modest and socially strong folk, seeing themselfs as a large community and acting accordingly. They're passionate researchers and prefer to visit public bathhouses where they talk about god and the world for hours. They encounter enemies with great understanding, helpfulness and naivete which is hardly comprehensible for evolutionary breeds. The community of the Nazra is strongly oriented to science but also appreciates tradition and culture. It does neither know unemployment nor homelessness and is organized deeply democratic. Harmony is very important because the mood of each individual has a direct effect to the Nazra around them. Apart from the thoughts network which subtly disseminates such feelings, they show their emotional state through a clear body language. In addition to human characteristics like blushing, nervousness, eye movements, etc. their ears underline the respective impression. It might be a slight twitch, often meaning curiosity on the right side and embarrassment on the left, a joyous straight raise of both ears or a strenuous lowering towards the shoulders. In the first 12 years of their lives the young Nazra are nursed and instructed by their grandparents. This ends when they receive their personal Ya and become teenagers. This next phase lasts until the age of 36 and is concluded by the sexual maturity, which leads to adult life. In these years offspring are begotten, where again the grandparents take care of their education. This active time lasts until the age 72 which thereby closes the first life-half (n200). The second half begins with the aged phase and lasts until the age of 108, which marks the beginning of the high age. Finally, the old age begins at 132 and continues as long as it lasts. Although the family is important for the Nazra, the society mostly assumes the parenting of the children. Teachers but also strangers rebuke the young Nazra, impart knowledge or clarify fallacies. The art of the Nazra is ephemeral and constantly changing. This is due to the fact that the bond to the art is also a bond to the artist and the presented content isn't conserved (as well as music or plays). Although the technical possibilities are available for recording video and sound, they aren't used. All Nazra speak an unified language without dialects. Originally, this communication took place almost exclusively on the telepathic channel but nowadays predominantly spoken words are used. This development is attributable to the Nazra'yot, a written language, which is increasingly used in the everyday world. It was originally developed as a machine language to communicate with different devices but then it was discovered as a figure of speech and mode of expression. Since then it is constantly developed further in the social field. Nazra like it to laugh but only rarely and shortly; usually a good joke causes just a hilariously giggle. Due to their body physiology they can't stand a laugh for long, so after a short time they're lying panting and twitching on the floor. This recovery period takes up to a minute, the euphoria then takes a little longer and leads to an enterprising behaviour. What takes a Sprootie, if it finds an open treasure chest? The key! Imagine the sun shines blue. All the work here would be in vain! Difficult is primarily to find the plausible fact. Even with a blue shining sun, blue wouldn't be completely invisible, would blue not completely be invisible but above all in this case the painter would anyway use a different color. Which is the most economical pet? The moth – she eats holes! With puns you can achieve little. At best, the jocular statement is completed by the Nazra with "...in organic material" or equal corrected: "No, it eats fabric." When many Nazra live close together, a subconscious network connects their minds. This networks transmits feelings and moods within the group. In larger populations even knowledge and experience are spread. The network is also used as a democratic instrument for important votings. Nazra wear almost only large robes like wrapped fabrics, skirts or kimono-like pieces. Depending on the weather and taste several garments are carried stepwise over each other and are tied together with fabric bands. They don't wear underwear. The most common shoes are lace-up shoes similar to sandals. Fur and leather clothing is worn only in colder regions. Jewelry is worn by Tayame (women) and Norume (men) equally but not by Etaime, the third gender. Most pieces are necklaces and filigree jewelry chains which are worn around the wrists and feet. Also belly chains in combination with belly-free clothes are very popular. Sometimes the neck and belly chains are decorated with a pendant (e.g. crystallized flower blossoms). Between the age of 10 and 12, young Nazra are subjected to a ritual in which they receive their personal Ya, a wooden staff decorated with shiny ornaments and a focus crystal incorporated in its tip. With its help, the owner is able to focus his mental abilities and use them properly. The staff is also important to society, for example it is raised at greetings and briefly inclined forward during important agreements. Traditionally the Ya is inherited within a family. "The price is n130 Kyo." The Nazra have 2 different currencies: Kyo and Tai. The Kyo is controlled by the state and equally distributed to the entire population. It is used for basic needs such as food, housing, teaching materials or simple clothing and furniture. Also the health institute is financed with the Kyo. The Tai, on the other hand, is responsible for luxury goods and has to be earned by extraservices such as degrees, charitable work or breakthoughts in research. There're a number of folk festivals in the culture of the Nazra but most of them are dedicated to a natural event. As example, the annual rain fesival on Ancyria starts with the first rain shower after the drought in the middle of the year. Generally they prefer to celebrate big – instead of individual birthdays, for example, an annual family festival and (also annually) the continuance of the entire race are celebrated. The architecture of the Nazra is purpose-built, however is supplemented by curving shapes. The facades are predominantly light gray and smooth, combined with glass areas and often decorated by water and plant streaks. In general, the architecture is informal elegant on the outside and simple and practical in the interior. Particularly noteworthy are the impressive energy towers which can be found in all nazranian cities. Beside of that the cities are essentially characterized by many smaller family houses. Those are populated by four generations (about 30 people) living on several floors. Alternatively, there are three-story houses for one to six people which are mainly located in the outskirts. The crystal energy of the Nazra is extracted from the rare Yer'is-radiation which is hardly found in the nature. Within Ancyria and later on Nazrani, their needs are covered by the artificially installed sun, but this doesn't apply to the Arkorium. During this time, they travel though the space on six arks and are dependet on the energy stocks they brought along. Because in Ancyria the length of a day is coupled to the outside world, the days are the same in both worlds. However the Nazra don't divide the day in hours but rather in 1'296 minutes and every minute is 36 seconds. A Nazra-second lasts about 1,85 seconds. For the conversion from and into the human clock-system the factor 0,9 can be used, whereby the time must be calculated in minutes (e.g. 65 for 01:05). The division of the years into larger units was taken over by the Zra. The information is given in three parts: epoch, age and period. For everyday use, one year has 6 months and every month 36 days. The epoch is a continuous number without a natural reference point. An epoch lasts 46'656 years according to the time calculation of the Nazra or about 21'600 according to the humans. In historical documents the term "anniversary" is also used instead of epoch. The age refers to the stage of evolution (0 to 36) within the universe. The period is the cyclic run (currently the 28th) of the universe. Example: The first contact is dated as 15th Febron of 9'385. epoch of the third age in the 28th period or abbreviated: 15.2.9'385.3.28. Nazra reach a height between 220 to 275 cm and are built slim and gracious. Notable are their pointed ears which are slightly downward in the relaxed state and their small, also pointed nose. Their eyes are dominated by oversized, red pupils. An average Nazra is as strong as a 12-year-old human boy. The lack of strength is compensated by their special skills which depend on their intellectual fortitude. Usually each Nazra wears a Ya (ornated wooden staff) in the right hand. 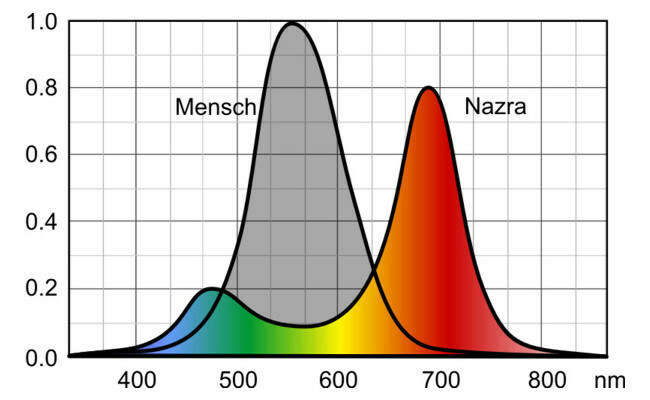 Eyes: Nazra perceive a color spectrum of 400 to 820 nm with a concentration in the reddish and a smaller in the blue-green area. Compared to humans they've a somewhat broader spectrum which extends into the infrared range. Ears: The ears of the Nazra hear sounds between 10 to 40'000 hertz and can perceive clearly very low noises. They're also good indicators of their emotional state. Nose/Tongue: The sense of taste of the Nazra is slightly below the taste of a human. The gustatory perception can distinguish sweet, salty, sour, bitter and metallic, although the general fondness is salty. Skin: The skin of the Nazra is about as sensitive as that of humans. However there's a difference in the perception: Pain isn't unpleasant for them. Like for the eyes it doesn't matter whether they see a red or white surface, they perceive pain completely dissociated. Brain: In larger communities, a subconscious network out of thoughts will be formed which spreads emotions and general impressions among all involved. In this way a sixth sense is formed that can also be called premonition. These premonitions are correspondingly valid for social affairs and only within the community. The metabolism of the Nazra absorbs carbon dioxide from the respiratory air and converts it into glucose and oxygen which is comparable to herbal photosynthesis. However, this transformation doesn't occur through photosynthesis, but rather with ordinary body energy. To store the necessary water, the body of the Nazra has got an organ called waterintestinal which is remotely comparable to the human bladder. As poikilothermic (intermittent) mammals their body temperature adapts to the temperature of the environment. Particularly remarkable is that at very cold temperatures they fall into a cold sleep, in which they are able to survive several months without food. In the course of this the heart is just fast enough to maintain the minimal body functions (about 1-2 times per minute). A prequisite for the cold sleep is that sufficient water and salt have been absorbed before, so that enough physical anti-freeze can be produced. This keeps the blood from freezing through water intake from the cells, so that the growing ice crystals can't destroy them. Nazra eat primarily fish, vegetables an cereals (in this chronological order). Her specialties are all types of seadfood and special bakery products. Meat is rarely and steamed eaten, while they mostly reject mushrooms. Salt is very important for their health, therefore it's represented dominant. So the Nazra know (almost) only salted drinks, especially common salt water is drunk in large quantities. Especially popular are accordingly salted fruit juices. Beer, vine and other alcoholic drinks doesn't exist because alcohol impairs their metabolism even in small amounts . Nazra normally eat in the intended public canteens where lunch and dinner is cooked for all. They're cared by the respective city (or directly by the state) and offer dine for Kyo (currency). Only on special events is cooked and eaten at home, or a small room is rented for the evening. Nazra possess a range of abilities which summarize to telepathy, telekinesis and teleportation. These abilities are immanent but to use them they need a special staff called Ya (Plural: Yame). This ornated wooden staff carries a focus crystal at its top that helps bundling the wearers mind. This process is best comparable to glasses removing the blurred vision, except for thoughts. Telepathy: Nazra primarily communicate in a telepathic way, even when facing each other directly. To do this, they need their Ya which allows them to have private conversations as well as hearings or group discussions. Furthermore in every major agglomeration a subconscious network of thoughts (Set-tao) is established which is mainly responsible for living together without problems. Telekinesis: By using their Ya, Nazra are able to influence matter with their willpower. Like a potter shaping a vase from his clay, they can move, deform, dissolve, change the composition or the temperature of almost any object. Teleportation: Each owner can fetch their Ya by pure willpower, as long as the distance between them is less than 2 km. Fetching into the air is enough the make the Ya materialize immediately between the fingers. For all other types of teleportation a Ya is necessary, fin other cases the amount and distance depend on the available energy level. There're three types of genders of Nazra. Noru: Norume (male) are somewhat harder built than Tayame. They're 140 years old and get between 230 to 260 cm tall. Taya: Tayame (female) are slim and have softer contours than Norume. They're 145 years old and reach a height of 220 to 250 cm. Her breasts are clearly pronounced. Etai: Etaime (neuter) are impotent, therefore they never have descendants. They're 170 years old and reach a height of 240 to 275 cm. They're recognized by their bright tail which emanates from the tailbone and just falls to the ground. They represent only a small part of the population (less than 1%) and work mainly in the administration. The gender of the baby is formed during the birth and depends on whether more male or female Nazra are present in the environment. In an average population evolve 57% Taya, 42% Noru and a handful of Etai. 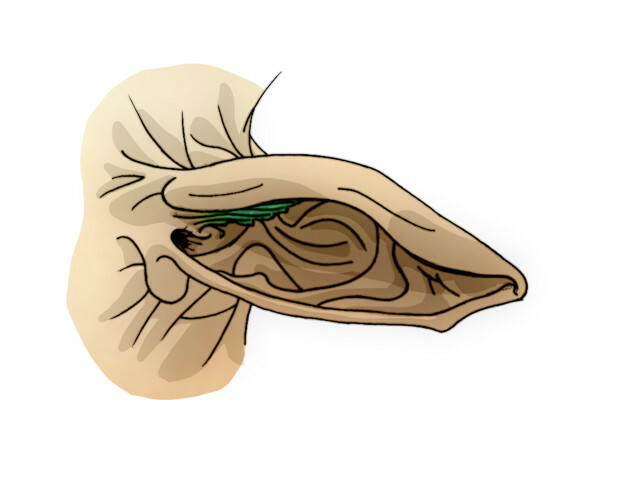 For the reproduction of the Nazra, essentially two organs are important: The ears and the brain. First, the sensitive flattered skin of the ears is stimulated by rhythmic stroking or rubbing which can lead to a pleasent laziness or in extreme cases to a rigid. Although Etai are infertile, they can be stimulated in the same way. Finally, the bodies of the participants are flooded by happiness hormones which leads to a slight tremble. This state can last up to one minute, while the genetic material of the Noru is transmitted telepathically to the Taya where it is mixed with her own. During this process both partners are unable to act because their brains are almost completely locked by the transmission of the genetic material. When the process is completed, the gender of the child is determined by the thoughts network and the biological pregnancy begins. The procreation of descendants is subject of the governmental control. Generally one child per person and generation is allowed to keep the population constant. The long, often openly worn and sporadically bound in wips hair appears in a variety of pastel colors and is extremely filigree. Over a lifetime it gradually grows together and fades until only a light gray hood stays at the final stage. By weaving ribbons in the hair which they especially do at important events for future memories, the hair is also culturally important. Reasonable: Nazra only destroy for good reasons. They'd never hunt animals or destroy cities for fun. Respectful: Nazra try to preserve what was cultivated or created. They'd never cut a hundred-year-old tree, as long as the situation allows more respectful solutions. Dynamic: In their own interests they don't eschew changes. Especially their language and cultural doings are often adjusted, as soon as a benefit is obvious. The decision about that will be determined by vote. Fair: Nazra don't steal. Even if a shopkeeper for example offers a price too low, they'd make him aware outright. Passive: Nazra interfere in the affairs of other beings extremely rare. They would never protect a village against robbers without a good reason or rescue human babies from burning houses. This behaviour is often misinterpreted as cold-bloodedness. Faithful: Nazra don't know unfaithful. They would never let a contract unfulfilled. However, they're appropriate care with its promises; these are always limited in all directions (especially in time) and often require new negotiations. Modest: Nazra don't find pleasure in personal luxury. They would never live in a castle with servants or get made the same dish by several cooks just to choose the best out of them. Curious: Nazra strive for understanding. They would never accept a phenomenon alone and even puncture resistant justifications are checked in time. For this reason almost every Nazra does research in leisure. Honest: Nazra don't lie. At best, they hide something but divulge it immediately in demand. It's also apparent in the colloquial language. For example on the question "How are you" you'll never get a defensivly "fine" as feedback but rather "I'd rather not say" or " My body is healthy" which offers the possibility to clarify the question if interested. Directly: Nazra say what they think. It may happens that a conversation is stopped abruptly with the words "Thank you for your view, but what you say doesn't interest me". What seems rude and tactless for humans, is a gesture of respect of the Nazra - they don't want to steal unnecessary time and try to avoid the embarrassing situation to have to admit later they're not interested in the topic. Fearless: Nazra don't feel fear but have to evaluate intentiionally chances and risks to assess a situation. That doesn't mean that Nazra take greater risks than others - by the lack of fear reflex they react even more advisedly and carefully. Accordingly they can't be frightened and jump away reflexively - even if a real threat appears in front of them. Therefore in a battle where fast reactions are required, it's important for them to predict the actions of their opponent correctly. Patiently: Nazra are very patient, therefore they're good teacher. If something is not understood they go further and further and clarify details to make the topic understandable. Social: Nazra are very sociable and delight in music and play. Nazra would never refuse an foreign being, just because e.g. it looks threatening. First they encounter each with openness and curiosity. Unwaveringly: Nazra are convinced of themselves and their view of the world. They aren't closed to new arguments but try to refute them with all their strength. Only when this fails, they change their minds and start to defend their new view with the same persistence. Gullible: Nazra are trusting by nature and assume that other beings also act sincerely and honestly. Even after numerous incidents (and appropriate negative experience with the opposite) the Nazra can still fall for false allegations. The blood of the Nazra is dark green. Norume are right-handed, Tayame left-handed and Etaime both-handed. Imo'dan-deya was a sociologist, philosopher and author of the Nazra. He spent much time among humans and wrote the book "Men'zra", a self-critical altercation about the meeting of the two cultures. "Those humans are a remarkable species which check themselves continually by their constantly self destruction and ruthless exploitation of any resources and thereby propel themselves to peak performances. As dynamic Survivalist they depend on the momentum, so they don't get used to their situation and by that become remiss. The biggest goal is their own advantage which they reach by giving up their inner peace." "The world is merely a grain of sand on life's kitchen floor. Small and meaningless it earns no attention from the gods above. Not even when it's washed away along with the other dirt." "I don't like these lazy bastards."